OR THE Art and Mystery OF COOKERY Wherein the whole ART is revealed in a more easie and perfect Method, than hath been publisht in any language. 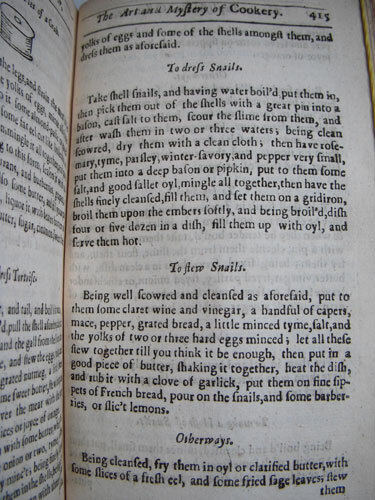 Expert and ready Ways for the Dressing of all sorts of FLESH, FOWL, and FISH, with variety of SAUCES proper for each of them; and how to raise all manner of Pastes; the best Directions for all sorts of Kickshaws, also the Terms of CARVING and SEWING. An exact of all Dishes for all Seasons of the Year, with other Al-a-Mode Curiosities. 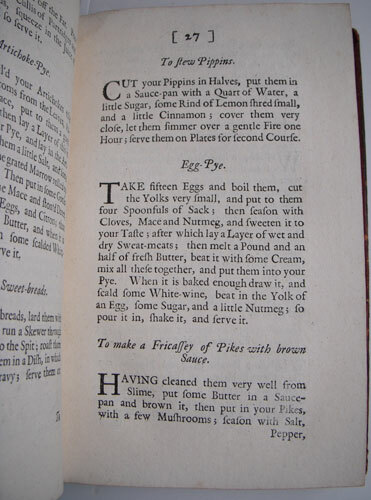 The Fourth Edition, with large Additions throughout the whole work: besides two hundred Figures of several Forms for all manner of bak'd Meats, (either Flesh or Fish) as Pyes, Tarts, Custards, Cheesecakes and Florentines, placed in Tables, and directed to the Pages yhey pertain to. Approved by the Fifty Five years Experience and Industry of ROBERT MAY, in his Attendance of several parsons of great Honour. London, Printed for Obadiah Blagrave at the Bear in St. Pauls Church-Yard, near the Little North Door. 1678. 8vo. 1fep. Frontispiece. Title page with single line border. 2pp. The Epistle Dedicatory. 4pp. The Preface. 3pp. Authors Life. 5pp. Triumphs and Trophies. 8pp. Of Carving and Sewing. 6pp. Bills of Fare. 1-461. 10pp. The Table. 1p. Books Printed. 1fep. The four plates are present; 2 have been expertly repaired without loss but with some browning at the folds. Internally very clean with numerous woodcut illustrations in the text. Contemporary full dark brown calf boards with nice patina. 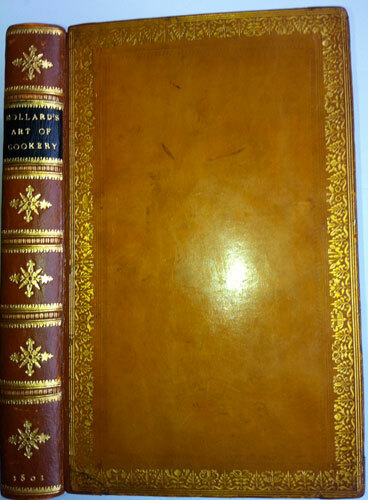 Sometime very sympathetically re-backed spine with raised bands, blind tooling and gilt lettering. A very nice copy and extremely scarce in the complete state. 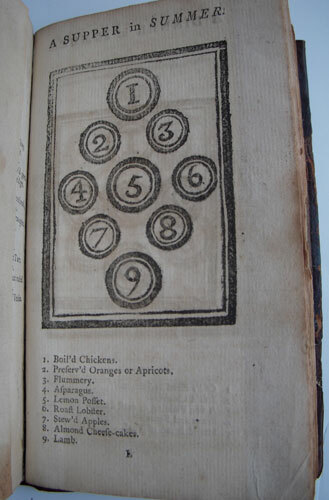 - Other Editions are; 1660 (1st) 1665 (2nd) 1671 (3rd) of which there are 2 imprints. 1678 (3rd & 4th) 1685 (5th) As a Frontis there is a portrait of May with 'AEatis Suae 71, 1660' in the background and beneath are the lines "What! wouldst thou view but in one face -- all hospitalitie the race -- of those for the Gusto stand, -- whose tables a whole Ark comand -- of Nature's plentie, wouldst thou see -- this sight, peruse May's booke, tis hee. -- Ja. Parry. For Nathaniell Brooke, at the Angell in Cornhill: There are two poems at the beginning in May's honour, and a story of his life which mentions that he was the son of a cook and he was trained in France. 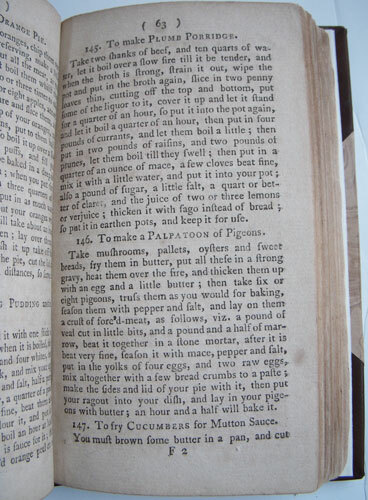 This training accounts for his giving nine recipes for preparing snails and one for baking Frogs. In the Preface May says that "God and my own conscience would not permit me to bury these my experiences in the Grave" and that 'The Queens Closet Opened' was the only book comparable to his own. 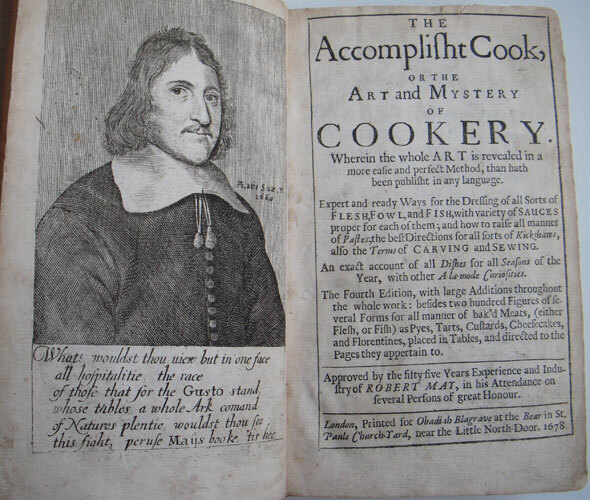 May's "Accomplisht Cook' is one of the great 17th century cookery books and one of the cornerstones of a good comprehensive cookery book collection. It is the record of a professional cook of that time. It is a well laid out book covering all aspects of the contemporary kitchen. In some editions there are two very large plates which unfold. This edition (and most others I have seen) has the two large plates separated into four. BEING A complete System of French Cookery. Adapted to the Tables not only of the Opulent, but of Persons of moderate Fortune and Condition. 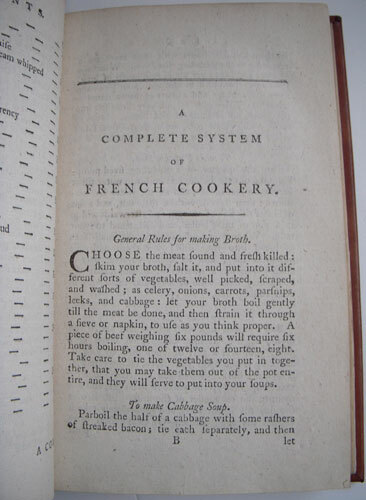 CONTAINING Directions for choosing, dressing, and serving up all Sorts of Butcher Meat, Poultry, &c. The different Modes of making all kinds of Soups, Ragouts, Fricandeaus, Creams, Ratasias, Compots, Preserves, &c.&c. as well as a great Variety of cheap and elegant Side Dishes, calculated to grace a Table at a small Expence. Neccesary for Housekeepers, Butlers, Cooks, and all who are concerned in the Superintendence of a Family. TRANSLATED FROM THE FRENCH. LONDON: Printed for J. BELL, No. 148, Oxford Street, nearly opposite New Bond Street. M.DCC.XCIII. FIRST ENGLISH EDITION 1793. 8vo. 2feps. Title Page. 6pp Bills of Fare. (1)iv-xxiv Contents. (1)2-342. 2pp Advertisements. 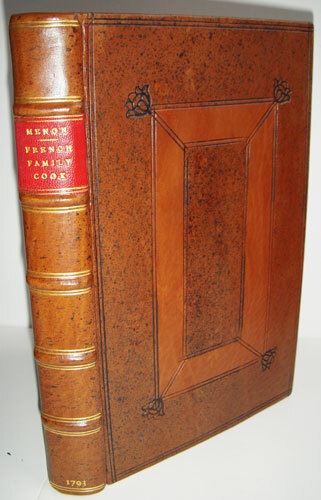 Fully bound in modern mid-brown calf, with 18th century style blind tooled panelled fillet on the boards with blind tooled line borders. Spine with raised bands and gilt lines, red label with gilt lettering. Internally extremely clean, as new. A rare item especially in this immaculate condition. 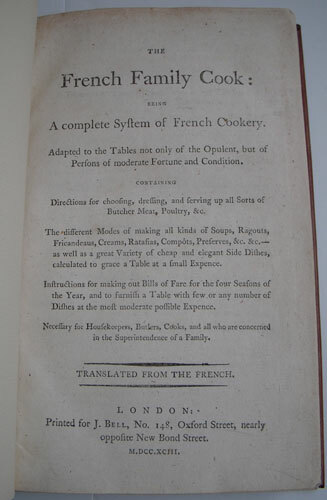 - Although no author is named on the title page, this is the first English translation of Menon's - La Cuisiniere Bourgeoise, originally written in French, and published in Paris, 1746. 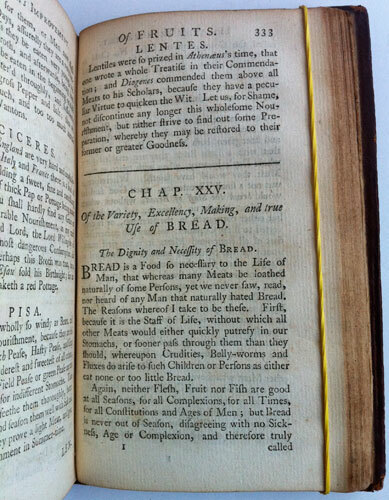 Maclean notes a 4th edition of 1796 with an altered main title, although sub-titles unchanged. 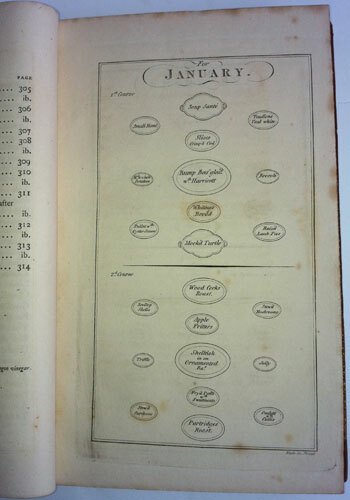 Menon's books excite a lot of interest but nothing was known of him, till very recently; Sophie of Sophie Schneideman Rare Books had an early two volume set of 'La Cuisiniere Bourgeoise' dated 1752. This set was the author’s own copy, signed on the first page. It was the copy from the Chateau de Villiers library according to small pen inscriptions on each title and tiny stamps on the first blanks. The first blank of the first volume bears the remarkable history of the book, written in ink in 1875. The story it relates is that the first owner of the book was Mrs. Menon. It next passed to Margueritte Menon, her daughter, who was married to Claude Dodant. The next recepient of the set was Anne Dodant, wife of Henri de Villemenard. Their son Charles de Villemenard next owned it, there-after going to to Marie de Villemenard and finally to the author of the note, Villiers. The note is initialed and dated. Interesting; this is now the most up-to-date information on Menon. Perhaps with this little bit, further relevant information can be garnered in the future. His books in French and English are much sought after and constitute an important addition to any cookery book collection. IN COOKERY, CONFECTIONARY, PASTRY, PRESERVING, CONSERVING, PICKLING; AND THE Several Branches of these ARTS necessary to be known by all good HOUSEWIVES. By JOHN MIDDLETON, Cook to his Grace the late Duke of Bolton. Revised and Recommended by Mr. HENRY HOWARD. LONDON: Printed for THO. ASTLEY, at the Rose against the North Door of St. Paul's. M DCC XXXIV. FIRST & SOLE EDITION OF 1734. 8vo. Title Page. (i-iv) (1-249) 8pp 'Index' 1p 'Advertisement' Fully bound in contemporary light brown calf (sometime re-laid) with gilt lined borders. Spine with raised bands and faded gilt lines and a green label wit gilt lettering. Internally very clean - almost as new. The paper is unusually thick. 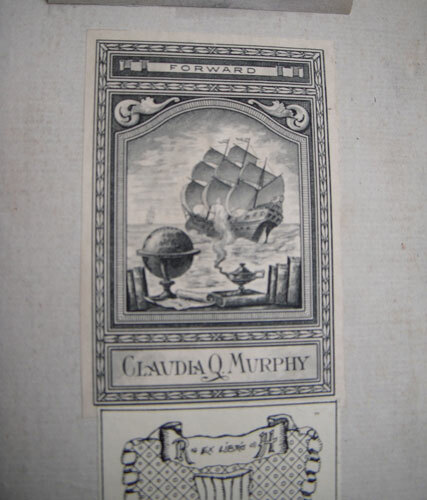 With three bookplates, one of which is Claudia Q. Murphy's. A very scarce item. - There appears to be two types of first issues. This one which is the large and thick papered version. A thinner paper issue also exists. 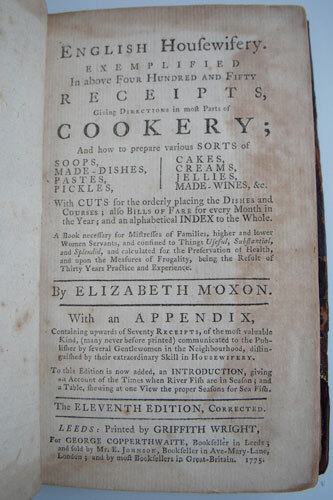 The title page is featured in MacLean's 'Catalogue of Household and Cookery Books 1701-1800' She states that it is her favourite eighteenth century cookery book title page, among all others. It is very distinctly laid out with the printer 'Thomas Astley's' emblem of a Rose featured predominately. (The rose could also be mistaken for an artichoke!) The whole is surrounded by a two line border. This copy was sold, April 19th. 1926, at the auction rooms of Anderson Galleries, New York City, from Claudia Q. Murphy's cookery book collection. It went for $2.50. The sale also featured many other rare items for around the same prices. How one wishes 'time travel' was possible. 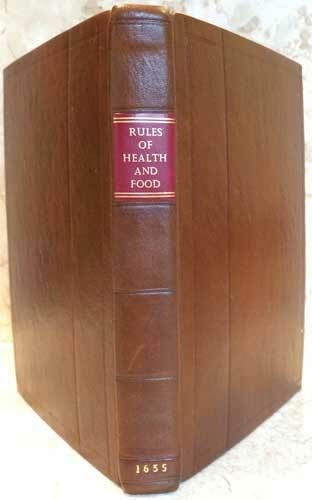 OR, Rules Comprizing and discovering The Nature, Method, and Manner of Preparing all sorts of FOOD Used in this NATION. (A single flat line) Wriiten by that ever Famous THOMAS MUFFETT, Doctor in PHYSICK: (A single flat line) Corrected and Enlarged BY CHRISTOFER BENNET, Doctor in Physick, and Fellow of the College of Physicians in London. (A single flat line) LONDON, Printed by Tho: Newcomb for Samuel Thomson, at the sign of the white Horse in Pauls Churchyard, 1655. FIRST EDITION. 4to. 190 x 146 mm. 1fep. Title page. Imprimatur page. 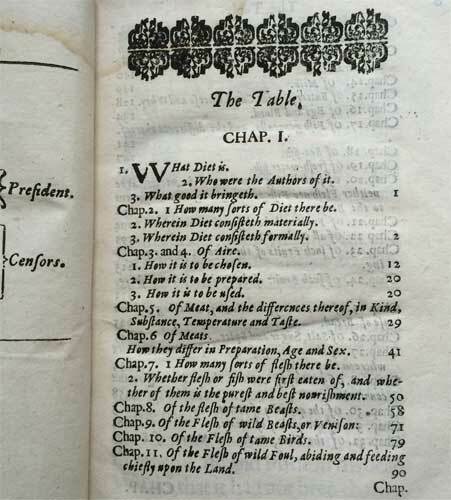 (1)2-8 The Table. 2pages To the Reader. 1-296. 1 fep. Full dark brown sheep. Blind tooling to covers and spine. Gilt lettering and red leather label with gilt lines. A very light small water stain on upper corner of the title page and next four pages, not affecting text, otherwise, almost as new. Some occasional marginalia in a neat hand. Many bibliographical sources printed in margins. An exceptionally nice clean copy of a very scarce book. - There exists a varied number of ways that Muffett (as spelled in this edition) is written. Cagle shows at least six ways. He also states Moffett is preferred by NUC, Mouffet by BMC, and Muffett by BNC. For the sake of filing them together on this site, I have used the later 'Moffet'. In an interesting historical thesis featuring Thomas Muffett, written and posted online by Christopher A. DeAngelo of Haverford College, PA, USA, who starts his dissertation with the famous poem:- “Little Miss Muffet sat on her tuffet / Eating her curds and whey / Along came a big spider / And sat down beside her / And frightened Miss Muffet away!”. Mr DeAngelo further states; "Thomas Muffet, the 16th century English natural philosopher, is best known today for the above nursery rhyme. He apparently wrote it about his daughter. Some people have even suggested that the poem refers to Muffet’s experiments on his daughter with spiders, which led to her being deathly afraid of them for the rest of her life. Despite the wide acceptance of these claims, there is no historical evidence to support any of them. Whether or not Muffett had anything to do with the actual writing of the poem, it is undeniably linked to him. The poem includes two concrete allusions to Muffett’s work. The spider is a direct reference to Muffett’s ‘Theatrum Insectorum’, in which the largest section deals with the classification of spiders. The curds and whey come straight out of ‘Healths Improvement’, where Muffett named curds and whey (both milk products) as essential to a good diet". 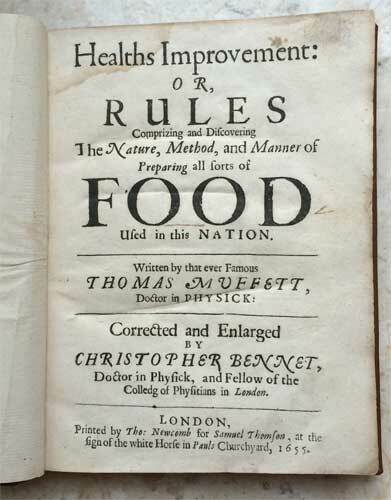 Thomas Moffett was born in 1553 and died in 1604, so it must be assumed that the Christofer Bennet mentioned in the title page of ‘Healths Improvement’ who corrected and enlarged the book, was the first one to edit Muffett’s manuscript notes. One must then wonder how much he added and what exactly is Muffett’s original work. Whatever the truth, this is a very interesting work. OR, RULES Comprizing and Discovering the Nature, Method and Manner Of PREPARING all sorts of FOODS Used in this Nation. 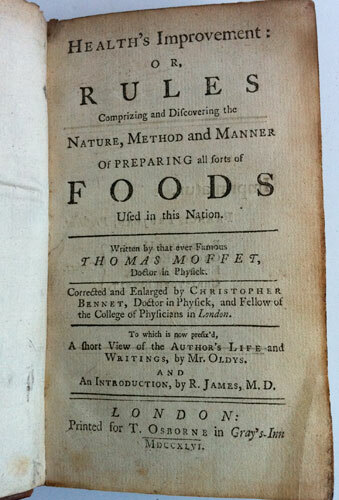 Written by that ever famous THOMAS MOFFET, Doctor in Physick. 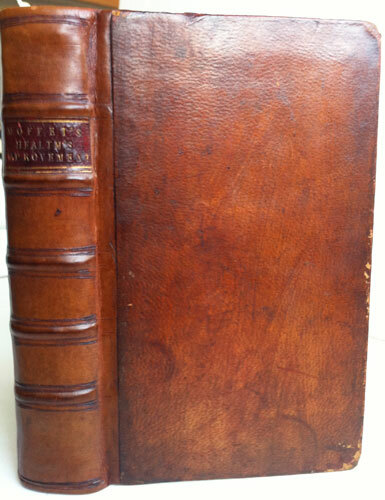 Corrected and Enlarged by Christopher Bennet, Doctor in Physick, and Fellow of the College of Physicians in London. To which is now prefix'd A short View of the Author's Life and Writings, by Mr. Oldys. AND An Introduction, by R.James, M.D. 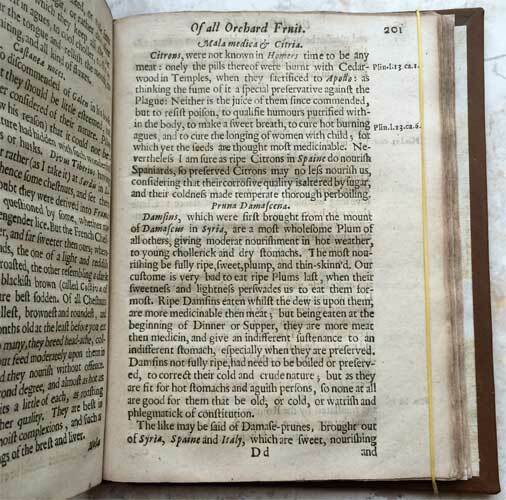 LONDON: Printed for T.Osborne in Gray's-Inn MDCCXLVI. 12mo. 1fep. Title page. On verso Imprimatur. 2p Epistle. 2p The Table. (1)viii-xxxii The writings of Dr Moffet. (1)2-66 Introduction. (1)68-398. 1fep. Full contemporary dark brown calf with nice patina. Sometime sympathetically relaid spine in dark calf with blind tooled lines and dark red label with faded gilt lettering. Slightly age browned throughout but overall a very nice copy of the second edition of 1746. - Very unusually, this second edition is printed ninety one years after the first edition of 1655. Thomas Moffet, (born 1553, died 5 June 1604), was an English naturalist and physician. He is best known for his Puritan beliefs, his study of insects in regards to medicine (particularly spiders), his support of the Paracelsian system of medicine, and his emphasis on the importance of experience over reputation in the field of medicine. Muffet was born to Thomas Moffet in Shoreditch, London. From the ages 8 to 16 years, he attended the Merchant Taylors' School. The following year, in May 1569, he entered Trinity College, Cambridge, however he only stayed there for two and a half years. In October of 1572, he transferred to Gonville Hall. He continued his education there until his graduation the following year, in 1573, when he received his Bachelor Degree. Afterward, Muffet studied medicine with Thomas Lorkin and John Caius. Three years later, he began his Master's program at Trinity College, at which point he was expelled from Gonville Hall. In Spring 1578 Muffet boarded with Felix Platter, chief physician of Basel, where he adopted the Paracelsian system of Medicine. In 1579, he was awarded his MD from Basel with a censored version of his thesis, entitled 'De Amodinis Medicamentis' (1578). The year after receiving his MD, in 1580, Muffet studied silkworm anatomy in Italy before finally returning to England. That December, he married his first wife, Jane, in St. Mary Colechurch, London. Two years later, he was recognized as a qualified physician by the College of Physicians in London. This was not expected, as Muffet was a strong advocate for the Paracelsian system of medicine, which was not widely respected by the medical community. Two years later, in 1584, Muffet finished his 'De jure et praestantia chemicorum medicamentorum'. 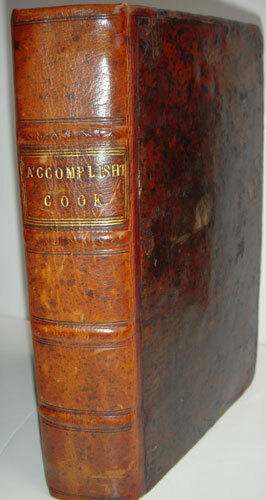 This document is said to have anticipated Bacon's emphasis on the advancement of learning. That same year, Muffet wrote a letter attacking the London College of Physicians for Papist influences through the lens of his own Puritan beliefs. The following year, however, he was admitted to the College of Physicians, becoming a fellow in February 1588. Later that same year he published his 'Nosomantica Hippocratea' advocating support for the work and writings of Hippocrates. Nine years later in October 1597, Muffet was elected as a member of Parliament for Wilton. Three years later in 1600, Muffet's wife, Jane, died. He married Catherine Brown that same year. Four years later on June 5, 1604, Thomas Muffet died at the Bulbridge Farm, in Wilton, Wiltshire. His work in nutrition was collected in his book 'Health's Improvement' which was designed more for the layman than for contemporary medical professionals. This work is the first with a list of British wildfowl, recognizing for the first time the migratory habits of many of them. This book was first published in 1655 even later than 'Theatrum Insectorum'. Robert Lovell's 'Panzoologia' is supposedly indebted to Muffet's descriptions of birds from 'Health's Improvement' and of insects from 'Theatrum Insectorum'. 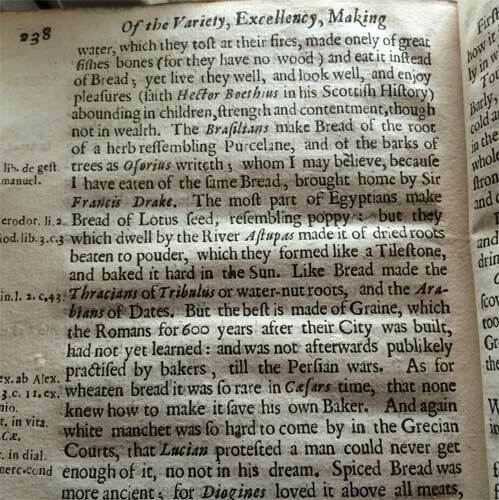 This is somewhat highlighted in the first recipe on page 245; Moffet describes being shown a dead flying fish from the West-Indies by Sir Francis Drake. Drake describes their taste as good and tender similar to herrings. 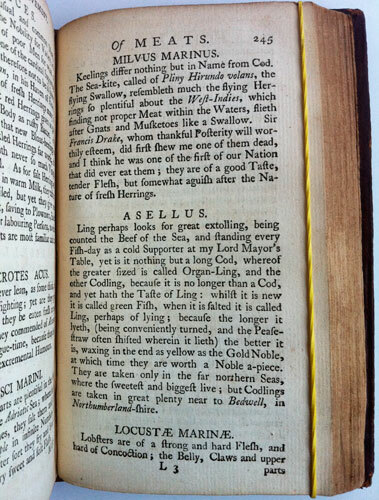 Further in page 245 Lobsters are described as Marine Locusts. 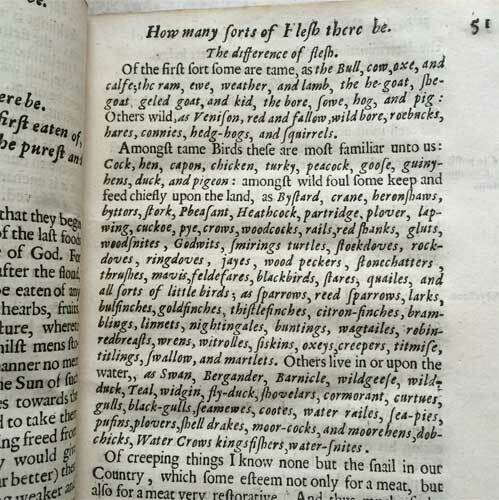 An unusual and interesting book of the time about all kinds of animals, fish and foodstuffs. MADE EASY AND REFINED; COMPRISING AMPLE DIRECTIONS FOR PREPARING EVERY ARTICLE REQUISITE FOR FURNISHING THE TABLES OF THE NOBLEMAN, GENTLEMAN, AND TRADESMAN. BY JOHN MOLLARD. THIRD EDITION. LONDON: PRINTED FOR THE AUTHOR; AND SOLD BY HIM, No 42, DOVER-STREET, LINCOLN'S INN FIELDS; AND J. RIDGWAY, No 170, PICCADILLY. 1807. Price 7s. 6d. T. Gillet Printer, Wild Court, Lincoln's Inn Fields. 12mo. 3feps. Title page. 1p Dedication to Proprietor of The London Tavern. (1)vi-viii. 16p Contents. 12 Plates of Monthly Table Settings. (1)2-211. 3feps. Modern dark brown half calf with marbled boards. Mild foxing throughout. 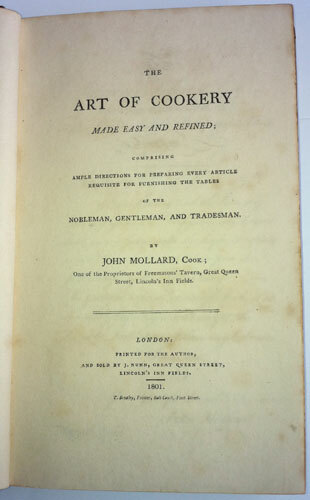 - This 1807, 3rd edition of John Mollard's 'Art of Cookery' is an interesting read. 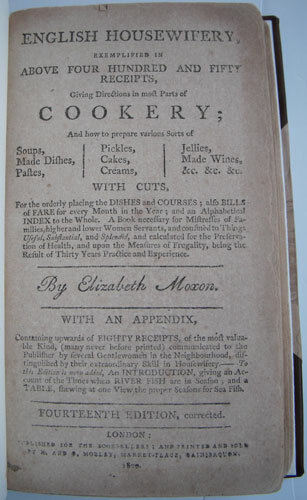 First published in 1801 and running to five editions by 1836 it gives many unusual recipes. 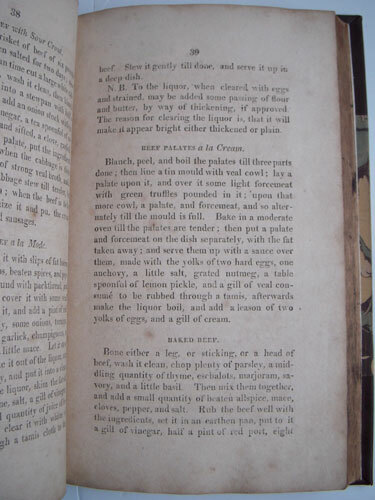 Here from the 1836 edition is Mollard's and the English take on ‘pilaf’ (or pillaw or pilau), -- 'Pilau Of Rice: Wash, pick, and boil a pound of rice in plenty of water till half done, with a dozen of whole cardamom seeds; then drain it, pick out the seeds, and put the rice into a stewpan, with three quarters of a pound of fresh butter and some pounded mace, and salt. Cut a loin of house lamb, or some fresh pork, into small pieces; put them into a frying-pan, add a small quantity of cinnamon, cloves, cummin and cardamum seeds pounded and sifted, with a bit of butter and some Cayenne pepper, and fry the meat till half done. Then add two bay leaves, and four good sized onions sliced, to a pint and a half of veal broth; boil them till tender and rub them through a tamis cloth or sieve. Then boil the liquor over a fire till reduced to half a pint, and add it to the fried meat and spices, together with some peeled button onions boiled. Place some of the rice at the bottom of another stewpan, then a layer of meat and onions on the rice, and so on alternately till the whole is put in. Cover the pan close, set it in a moderately heated oven for two hours and a half, and when to be served, turn the rice out carefully on a dish'. In preparation, because of the addition of meat, this is more of a Briyani than a Pilau. One wonders how separate the rice grains will be after 2 1/2 hours in the oven. Mollard's recipe for Twelfth Cake is the earliest known, and makes a large yeast-leavened bun, more like a stollen than a rich English fruit cake of the kind we now associate with Christmas. Cakes of this kind were usually baked in wooden hoops, or garths. 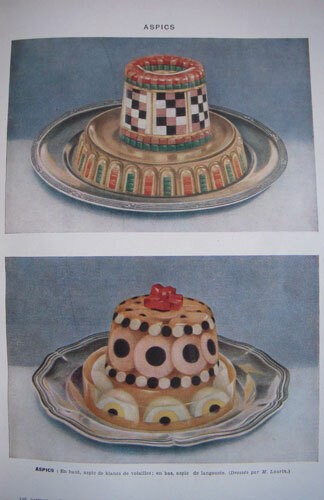 Twelfth cakes were iced with almond paste or sugar icing and ornamented with sugar-paste crowns and/or small sugar or wax sculptures of Twelfth Day characters. It is fascinating that there is not a single mention of vanilla, chocolate, or tomatoes in over 210 pages: sweets are all based on custard or fruit, and the ketchups are made from mushrooms or walnuts. With the three quarters of a pound of butter to a pound of rice required for the Pilau above, one assumes in the guests - bull-like constitutions. Truly the cooking of a different age.! MADE EASY AND REFINED; COMPRISING AMPLE DIRECTIONS FOR PREPARING EVERY ARTICLE REQUISITE FOR FURNISHING THE TABLES OF THE NOBLEMAN, GENTLEMAN, AND TRADESMAN. 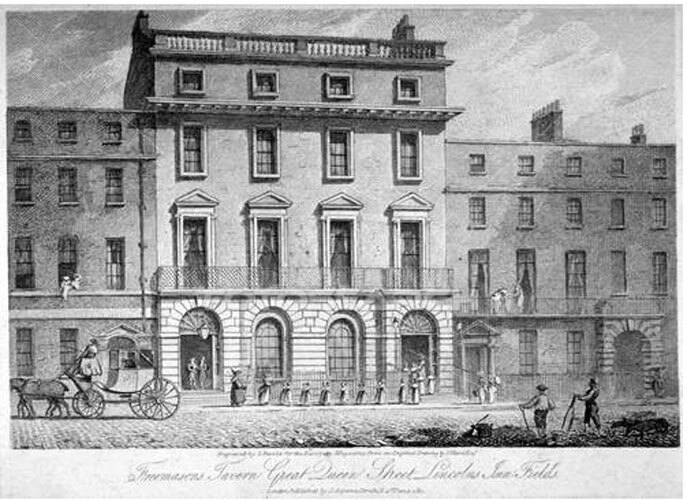 BY JOHN MOLLARD, Cook; One of the Proprietors of Freemasons’ Tavern, Great Queen Street, Lincoln’s Inn Fields. 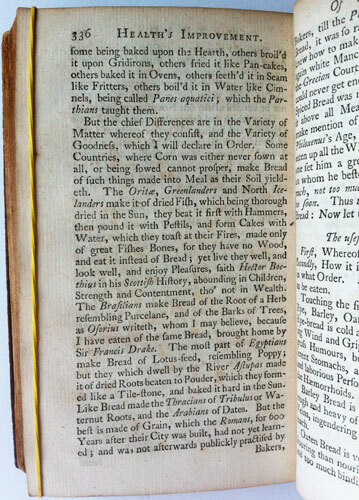 LONDON: PRINTED FOR THE AUTHOR, AND SOLD BY J, NUNN, GREAT QUEEN STREET, LINCOLN'S INN FIELDS. 1801. T. Beasley, Printer, Bolt Court, Fleet Street. FIRST EDITION. Large octavo. 1fep. Half-Title. Title page. 1p Engraved Dedication leaf to the Original Proprietor of The London Tavern, very slightly browned. (1)vi-viii Preface. (1)x-xxiv Contents. 12 Plates of Monthly Table Settings with each verso blank. (1)2-314. 21p Index. 1fep. The whole text block with wide margins. Modern dark brown full calf with with elaborate gilt tooled edges to the boards and the inner edges of the paste-downs. The spine with raised bands with elaborate gilt tooling and gilt devices in the compartments. With a black leather label and gilt letters. 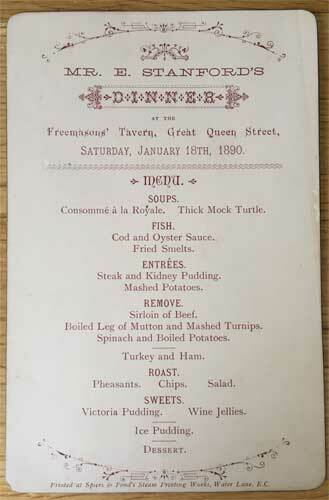 ALSO enclosed: A Freemason's Tavern Menu enclosed: Dated January 18th 1890. Mr E. Stanford’s Dinner. Consisting of six courses and seventeen dishes. Written in English. Printed on cream coloured card with gilt edges and fine decorative text. A very clean handsome copy of the very rare first edition, with the equally rare enclosed menu. - Before John Mollard owned the Freemason's Tavern he had been Head Cook at the London Tavern. 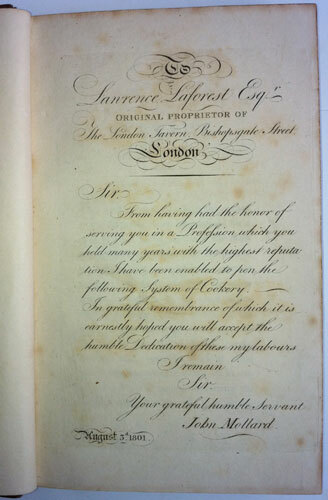 In this book the beautifully scripted and engraved page is dedicated to the London Tavern Proprietor - Laurence Laforest, therein Mollard proclaims Laforest as a man of high reputation in the same Profession. In the Old Bailey records for May 14th 1777 at the trial of a George Hawkins who had stolen an engraved silver bowl and spoon from the London Tavern, we learn that Laforest was the owner of the Tavern with three other partners, Thomas Simkins, John Bladen and Henry Caridge. The unfortunate George Hawkins was found guilty, branded with a hot iron and received 8 lashes of the whip. In the same records we learn that two ladies were sentenced to be carried and whipped for 100 yards along Bishopsgate Street past the London Tavern. The contrast between the fine dining establishment of high standards and repute and the raw life-scenes outside are startling in the extreme. Lieut-Col. Newnham-Davis in his book 'Victorian London' 1899, writes extensively of the Freemasons' Tavern, and it is worth repeating parts here to give a glimpse of Mollard's past workplace and jointly owned establishment. -- The Tavern is not what the name implies. It was a restaurant, with a large public dining-room, with a fine ballroom, and with many private dining-rooms. Its outside was imposing (see picture 1 below). Two houses stand side by side. Built of red brick, with windows set in white stone, and is Elizabethan in appearance. At the entrance to the Tavern stand two great janitors. Facing the doorway, at the end of a wide hall, is a long flight of stairs broken by a broad landing and decorated with statues. Up and down this ladies and gentlemen are passing, and I ask one of the janitors what is going on in the ballroom. "German Liederkranz. Private entertainment. What dinner, sir? Victory Chapter. Drawing-room,” is the condensed information given by the big man, and he points a white-gloved hand to a passage branching off to the right. On one side of the passage is a door leading into a bar where three ladies in black are kept very busy in attending to the wants of thirsty Freemasons. On the other side is a wide shallow alcove in the wall fitted with shelves and glazed over, and in this is a curious collection of plate, great salvers, candelabra, and centre-pieces. Beside the alcove is a glass door, and outside it is hung a placard with “Gavel Club. Private” upon it. At the end of the passage a little Staircase leads up to higher regions, and on the wall is an old-fashioned clock with a round face and very plain figures, and some oil paintings dark with age. On the first landing there is a placard outside a door with “Victory Chapter” on it, and higher up outside another door another placard with “Perfection Chapter” on it. From the stream of guests and waiters which is setting up the stairs it is evident that there are many banquets to be held to-night. The drawing-room is white-and-gold in colour. Four Corinthian pillars, the lower halves of which are painted old-gold colour, with gold outlining the curves of their capitals, support a highly-ornamented ceiling, the central panel of which is painted to represent clouds, with some little birds flitting before them. The paper is old-gold in colour with large flowers upon it. There is some handsome furniture in the room— a fine cabinet, a clock of elaborate workmanship, and some good china vases. The curtains to the windows are of red velvet. At the end of the room farthest from the door is a horseshoe table with red and white shaded candles on it, ferns, chrysanthemums, and heather in china pots, pines, and hothouse fruits, and at close intervals bottles of champagne and Apollinaris. At the other end of the room, where stands a piano, with a screen in front of it, the gentlemen in evening clothes are chatting, having put their coats and hats on chairs and piano wherever room can be found. The waiters, in black with white gloves, are putting the last touches to the decorations. I have eaten some good dinners at the Freemasons’ Tavern, and others not so good. Tonight the cook is not up to his best form, and has not responded to the inspiration of the meuu --- Crevettes - Tortue clair - Filets de sole Meunière - Vol-au-vent aux huîtres natives - Faisan Souvaroff - Selle de mouton - Céleri braise Bordelaise - Layer. Pommes Parisienne - Poularde rôtie - Lard grillé - Salade - Bombe glacée Duchesse - Os à la moëlle - Dessert - Café. The turtle soup is not like that of the excellent Messrs. Ring and Brymer, or that of Mr. Painter; the faisan Souvaroff is dry, and the cook’s nerve has failed him when the truffles had to be added; but, on the other hand, the sole Meunière and the vol-au-vent are admirable, and the marrow-bones are large and scalding-hot. After dinner, one by one the guests who have appointments elsewhere, or who are going to the theatre, say good-night and go off; but a remnant still remain, and these make an adjournment to a cosy little clubroom on the top story of Freemasons’ Hall, where good stories are told, and soda-water-bottle corks pop until long after midnight. There is a small Masonic dining-club, called the Sphinx Club, which dines at the Freemasons’ Tavern, and which I mention because the dinner I last ate in company with my brother Sphinxes was one of the best efforts of the chef and of the manager Mons. Blanchette — which means that it was very good indeed. The club was founded as an antidote to the large amount of soft soap that Freemasons habitually plaster each other with in after-dinner speeches. No Sphinx is allowed to say anything good of any brother Sphinx, and when a candidate is put up for the club his proposer says all the ill he knows or can invent about his past life. A candidate can only become a member of the club by being unanimously blackballed. It is needless to say that the best of temper and good fellowship is the rule amongst the Sphinxes, and the Freemasons’ Tavern seems to always have a very good dinner for them. 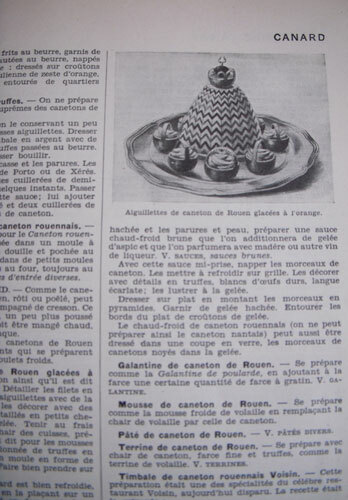 This was the menu of their last banquet --- Huîtres - Tortue clair - Rouget à la Grenobloise - Caille à la Souvaroff - Agneau rôti - Sauce menthe - Choux de mer - Pommes noisettes - Bécasse sur canapé - Pommes paille - Salade de laitues - Os à la moëlle - Petit soufflé glacé rosette - Fondu au fromage - Dessert - Café. THE MENU enclosed with this book: Dated January 18th 1890. Mr E. Stanford’s Dinner at the Freemason's Tavern; Consisting of six courses and seventeen dishes. Written in English, the menu offers relatively plain sounding fare compared to the more elegant dinner of the above Sphinx Club, that is presented in French, by Lieut-Col. Newnham-Davis, nine years later, in his book of 'Victorian London' dated 1899. The bibliographies have their usual variance. Oxford & Vicaire have each a first of 1801 and Oxford a 3rd of 1807 and a new edition, 1836. Bitiing has a 2nd of 1802. Cagle also has a 2nd and a 4th of 1808. FIRST EDITON. 4to. 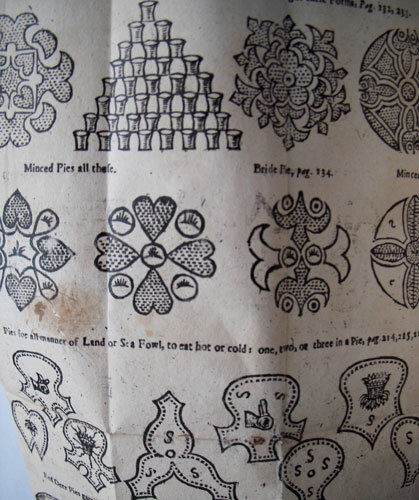 Patterned paste-downs and endpapers. Preface by A. Escoffier and Ph. Gilbert. 1850 engravings and 16 full page plates in colour. French text. Black and white photos & illustrations throughout. Contents very clean and bright with very little sign of use. Original embossed and decorated cloth boards and spine. Gilt lettering is bright and clean. A wonderful copy. - Alongside Georges-Auguste Escoffier's ‘Le Guide Culinaire’ and Louis Saulnier's ‘Le Répertoire de la Cuisine’, the Larousse Gastronomique became one of the key reference works on French national and regional cuisine for the professional chef. It is a reference text that codifies a history of the French culinary arts from the distant past to the present day in encyclopedic form. Entries cover such items as culinary terminology, foods, kitchen equipment, techniques, national cuisines, regional French cuisines, and historically significant chefs and restaurants. 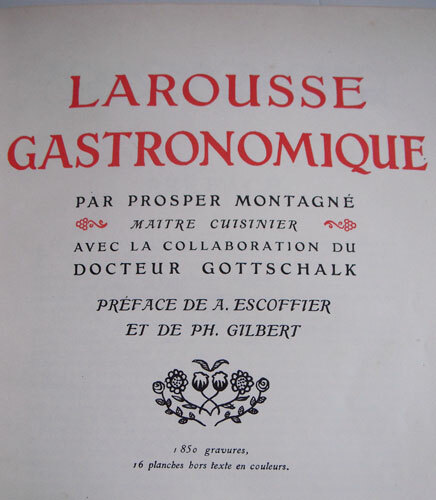 Philéas Gilbert was a collaborator in the creation of this book and also 'Le Guide Culinaire' with Escoffier, leading to some cross-over with the two books and causing Escoffier to note when he was asked to write the preface that he could “see with my own eyes, and Montagné (a Chef himself) cannot hide from me the fact that he has used 'Le Guide' as a basis for his new book, and certainly used numerous recipes.” Montagné's work signaled a break with the preceding era of French cookery (albeit with a big helping from his collaboration with the true Master; Escoffier) as exemplified by the architectural creations of Marie Antoine Carême. 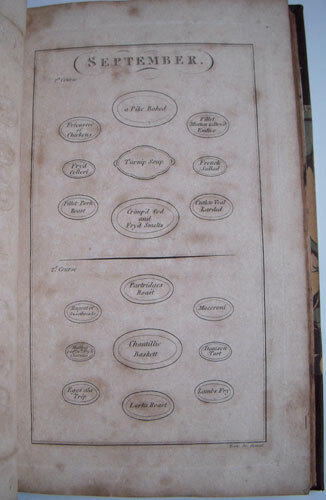 Montagné emphasized dishes that were simple by Carême's standards, and the shortened menus were delivered in the Russian style of service; meals served in courses on individual plates. This philosophy inspired the name of his culinary encyclopedia. 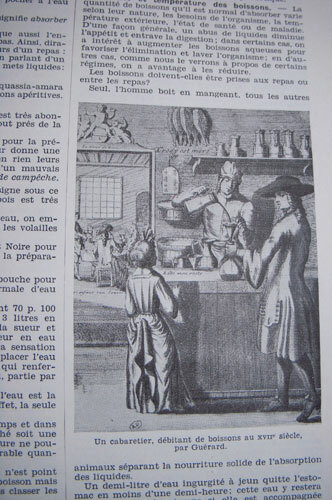 Montagné covered the range from the relatively new haute cuisine to French provincial and home cooking with some attention to classic dishes of other nations Three editions of the Larousse gastronomique have been published in English. The first edition was published in 1961. Jennifer Harvey Lang edited the second English edition, published in 1988, from the 1984 French edition compiled and directed by Robert J. Courtine. Courtine's introduction describes the first edition as a monumental work, albeit one in need of some refurbishment. The new editions take into account technical innovations, advancements in food science, and a new culture of dining characterized by simpler meals and a dietary palette expanded through travel and global commerce. Yet the core achievements of Montagné including his recipes and technical advice on classical and regional French dishes are preserved. For the third English edition, published in 2001, Jennifer Harvey Lang worked from a new French edition edited by Joël Robuchon, the president of the Gastronomy committee of the Librairie Larousse. 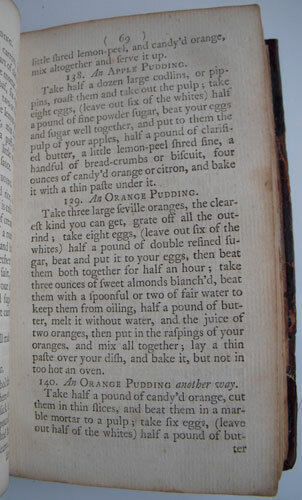 This edition claims to have retained the classic dishes and techniques of the original edition with a new found sensitivity to global influences in technique, presentation, ingredients, and recipes. It is 1,350 pages, over 150 pages longer than the preceding English edition and it includes two hundred new recipes and four hundred new entries. 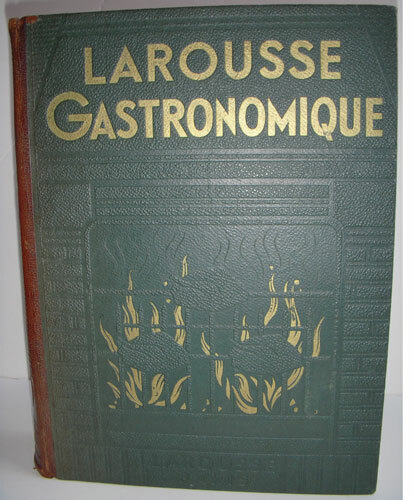 The Larousse Gastronomique no longer sits alone —- if it ever did. 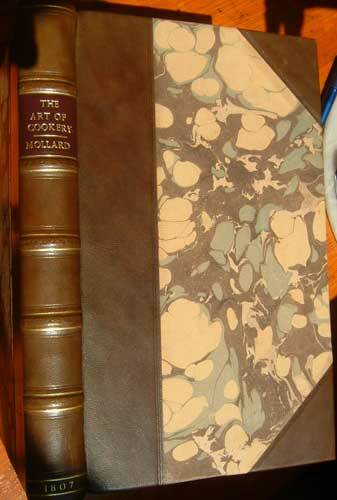 It does not provide the detail of the more narrow but specialized cookbooks. Nevertheless, it covers an immense breadth of culinary material, justifying its continued importance as a great volume of reference of French gastronomic tradition. Title page 1. 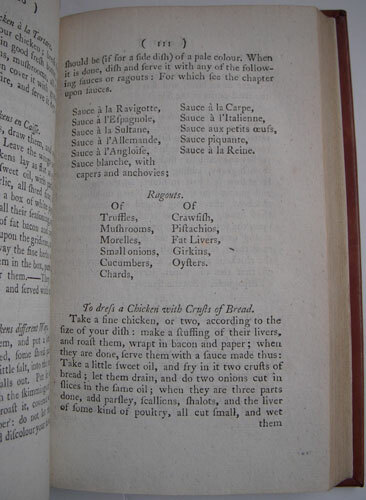 -- EXEMPLIFIED IN ABOVE FOUR HUNDRED AND Fifty RECEIPTS, Giving Directions in most Parts of COOKERY; And how to prepare various SORTS of SOups, Made-dishes, Pasties, Pickles, Cakes, Creams, Jellies, Made-wines, &c.&c.&c. 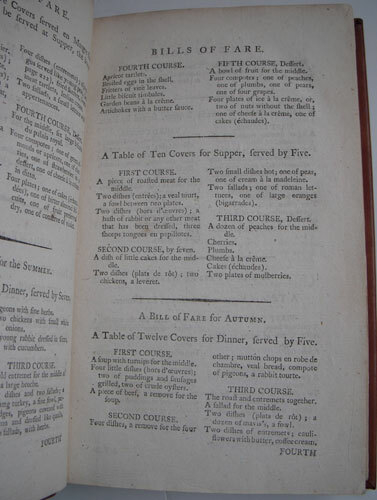 WITH CUTS for the orderly placing the DISHES and COURSES; also BILLS of FARE for every Month in the Year; and an alphabetical INDEX to the Whole. A book necessary for Mistresses of Fa-milies, higher and lower Women Servants, and confined to Things Useful, Substantial, and Splendid, and calculated for the Preserv-ation of Health, and upon the Measures of Frugality, being the result of Thirty Years Prectice and Experience. By Elizabeth Moxon. WITH AN APPENDIX. Containing upwards of EIGHTY RECEIPTS, of the most valua-ble Kind, (many never before printed) communicated to the Publisher by several Gentlewoman in the Neighbourhood, dis-tinguished by their extraordinary Skill in Housewifery --- To this Ediion is now added, an INTRODUCTION, giving an Ac-count of the Times when RIVER FISH are in Season; and a TABLE, shewing at one View the proper Seasons for Sea Fish. FOURTEENTH EDITION, Corrected. 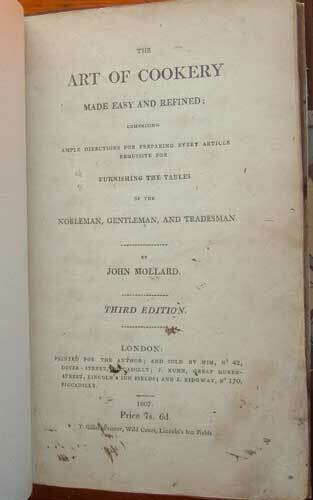 LONDON: PUBLISHED FOR THE BOOKSELLERS; AND PRINTED AND SOLD BY H. AND G MOZELY, MARKET-PLACE GAINSBROUGH. 1800. ---Title page 2. 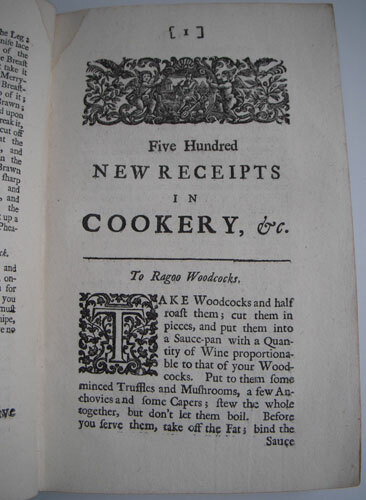 [Supplement] English Housewifery Improved OR, A SUPPLEMENT TO MOXON's COOKERY CONTAINING Upwards of Sixty Modern and Valuable RECEIPTS, In Pastry, Preserving, Made Dishes, Made Wines, &c. Collected by a Person of Judgement. WITH CORRECTIONS AND ADDITIONS. THE SEVENTH EDITION. 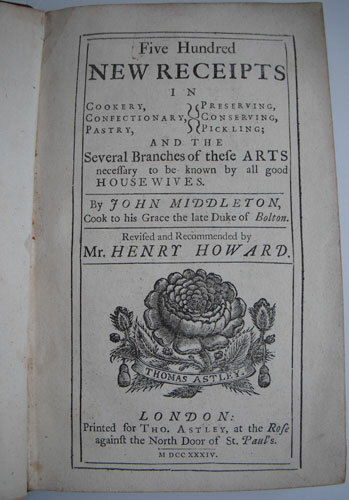 London: PUBLISHED FOR THE BOOKSELLERS; AND PRINTED AND SOLD BY H. AND G MOZELY, MARKET-PLACE GAINSBROUGH. 1800. 12mo. 3feps. Title page. iii Preface. (1)v-vii Introduction. (1) One plate of fish seasons. (1)10-172. Title page of the Supplement. 2-32. 8pp Bills of Fare. Six pages of engraved plates of Table settings with two folding. 6pp Index. 4feps. Half modern dark brown calf with marbled boards and calf corners. Internally all pages evenly browned throughout. Pages 13-14 and 23-24 are present but mis-bound. Half of page 13-14 is missing. - This imprint not found in any bibliographies. Bitting, p334 cites a 14th edition with no date. Oxford p78, cites the same 'suspicious' 14th with no date, by 'Elizabeth Moxon and Others' Printed and sold by Andrew Hambleton. 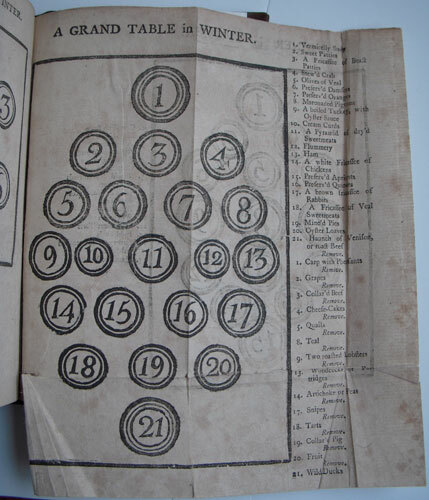 MacLean p106, also cites Oxford's 14th and with the printers as Andrew Hambleton and H. and G. Mozely but dated 1800. Craig p642, confusingly cites 13th (on the Title page) but states it is really a 15th and a Mozely imprint of 1789. 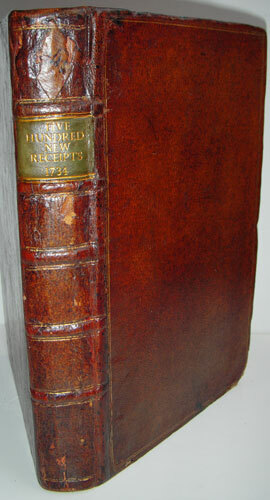 His next imprint is also a Mozely; a new edition of 1808. This copy is another 1800 imprint; to only be printed and sold by Mozely. That makes three copies of the 1800 edition, with two in the bibliographies and this one unrecorded. 12mo. Title page. iii-iv Preface. v-viii Introduction. ix-x Folding table of fish in season. 5-203. The Supplement. 2-33. 7pp. Bills of Fare. 8pp. Table settings. [2 folding] 8pp. Index. 2feps. The Title page lightly age browned. Text very lightly age browned. Table settings quite browned in places. Full contemporary dark brown calf. Relaid spine with raised bands and black label with gilt lettering. The boards have also been relaid but have a nice old patina. Overall an pleasing copy of a very scarce old book. 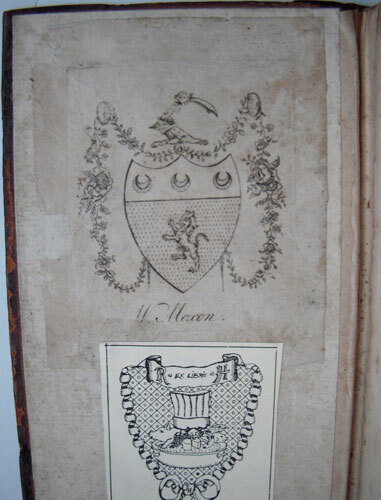 - This copy has an interesting bookplate, showing a coat-of-arms and the name W. Moxon. It has obviously been tipped in to the paste-down since the original binding. View a jpeg of the bookplate below, and I would appreciate anyone throwing some light on this intrigue.